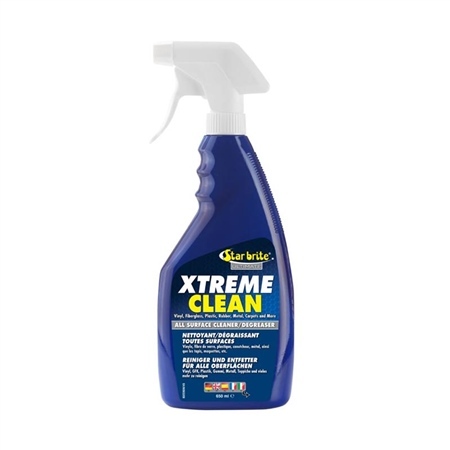 Ultimate Xtreme Clean Boat Cleaner. All purpose heavy duty cleaner formulated to whisk away grime, grease, oil, fish blood and stains Simple spray on, wipe off application. Special chelating agents break the bond that holds dirt or stains to surface without heavy scrubbing Cleans fiberglass, vinyl, plastic, metal and even inflatable boats. New gallon size for easy refill of 22 fl. oz. spray container. Removes even the toughest dirt and greasy stains, even on tough-to-clean porous surfaces. Special chelating agents break the bond that holds dirt or stains to surface without heavy scrubbing. Cleans fiberglass, vinyl, plastic, metal and even inflatable boats. Spray area to be treated, then use a sponge, brush or cloth to spread Ultimate Xtreme Clean evenly. Allow to work in for 15-30 seconds before lightly wiping or brushing. Rinse with fresh or salt water. Stubborn stains may require a repeat application that is allowed to soak in for about a minute followed by lightly scrubbing and then rinsing clean.